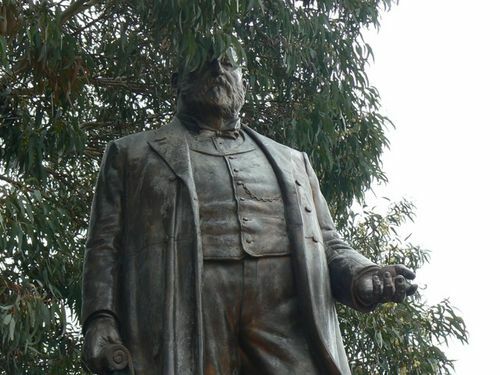 Statue commemorates Sir Thomas Bent, former Brighton Mayor and Premier of Victoria. The statue has significance as the first large public commission given to a woman sculptor in Victoria. This work helped the sculptor, Margaret Baskerville, preserve her name as Victoria`s first professional woman sculptor. Sir Thomas Bent KCMG (7 December 1838 – 17 September 1909) was an Australian politician and the 22nd Premier of Victoria. He was one of the most colourful and corrupt politicians in Victorian history. Sir Thomas Bent was responsible for many important speculative ventures both within his electorate and in the wider context of Victoria. Although not without thought for personal gain, Bent was a committed advocate of public utilities, railways, roads, tramways and gasworks. At Brighton on 27th October will be unveiled the statue, contributed to by citizens of the district in memory of the late Sir Thomas Bent. The original figure is the work of Miss Baskerville, but the statue itself is of hand-beaten and welded bronze, and has been executed by Mr. C. W. Marriott. The figure, about half as large again as life size, is almost completed. The making of a figure in beaten bronze, and welding the various portions together, is an art new to Melbourne. Through the discovery by a Frenchman of the means of welding metal, so that joints are not perceptible, a great asset has been placed in the hand of sculptors. The process is known as the oxygen-acetylene process, and has taken the place of the old method of riveting die pieces of bronze together. In placing a scroll in one hand, the sculptor has given to the figure an attitude well known to admirers of the late Sir Thomas Bent— that of the late member about to deliver an address. When completed the statue will appear like old bronze— a deep walnut color. Altogether 60 pieces have been joined in making the massive figure, which weighs considerably over one ton. The sheets of bronze, one-tenth of an inch thick, are almost as hard as steel, and the work of heating this metal into the figure and features of a human being is one requiring untiring patience. The material had all to be obtained in England. There can be no doubt of the success of the process, for no trace of any join can be seen in the figure, and so complete is the weld that there is said to be no chance of the parting of a join when once completed. The sections are beaten out in type metal by hand. No heating of the metal is possible. Owing to delays in obtaining the materials the statue has taken four months to complete. The site for the memorial has been fixed at the intersection of Point Nepean and Brighton roads, and the statue will be unveiled bv the Lieutenant-Governor, Sir John Madden, at 3 p.m. on 27th inst. Age (Melbourne), 20 October 1913. And For 45 years A Councillor Of Brighton And Moorabbin.